Earlier this year, we told you about the Lancaster Roots & Blues Festival, which is quickly gaining a reputation as one of the must-attend events for blues fans in the Mid-Atlantic region. Here are a few more festivals and shows scheduled for the coming weeks and months that might be worth the trip for those in and around the MD/DC/PA area. Sat., May 2 – UMCH Family Services’ Change Your Hue of Blue, Northland Performing Arts Center, Columbus, Ohio. A blues music benefit raising awareness and funds for family mental health, featuring 2014 Blues Music Award Koko Taylor Award (Traditional Blues Female) winner, 2011 Blues Music Award Best Traditional Blues Album winner (Trying to Hold On), and 2008 Blues Music Award Best New Artist Debut winner (Cotton Field to Coffee House) Diunna Greenleaf and Blue Mercy; 2014 Blues Music Award nominee for Acoustic Artist of the Year Little G. Weevil; and Chicago guitarist Joel DaSilva and the Midnight Howl. Sat., May 16 & Sun., May 17 – Chesapeake Bay Blues Festival, Sandy Point State Park, Annapolis, MD. Blues returns to the bay in a big way with performances from Gregg Allman, Buddy Guy, Charlie Musselwhite, Bobby Rush, Beth Hart, Tommy Castro & the Painkillers, Shemekia Copeland, Jonny Lang, Jarekus Singleton, a Chesapeake Bay Blues Band featuring Dean Rosenthal and current and past members of The Nighthawks Mark Wenner, Pete Ragusa, and Jan Zukowski, and more. Fri., May 29 – Sun., May 31 – 20th annual Western Maryland Blues Fest, City Center and City Park, Hagerstown, MD. Another great line-up featuring Lil’ Ed & the Blues Imperials, Matt Schofield, Ian Siegal, Mike Zito & the Wheel, Rod Piazza & the Mighty Flyers, Moreland & Arbuckle, Jarekus Singleton, Nikki Hill, Bonerama, the Kelly Bell Band, Hamilton Loomis, Albert Cummings, and more! Fri., June 12 – Sun., June 14 – Chicago Blues Festival, Grant Park, Chicago, IL. There’s probably never a bad year to check out this world-renowned free blues festival, but we’re not sure it gets any better than this year’s line-up. 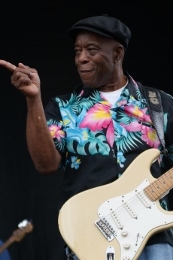 In addition to headliners such as Buddy Guy, Taj Mahal, Syl Johnson, and Clarence Carter, the weekend will also offer some pretty amazing centennial tributes to blues legends Muddy Waters and Willie Dixon, the former (in what just may be the blues event of the year) featuring a mix of Waters’ offspring, band members, and friends, including sons Mud Morganfield and Big Bill Morganfield, Bob Margolin, John Primer, Bob Stroger, Kenny “Beedy Eyes” Smith (son of the late Waters band member Willie “Big Eyes” Smith), Rick Kreher, Paul Oscher, Jerry Portnoy and Barrelhouse Chuck, and the latter being even more of a family affair featuring Dixon’s sons Freddie and Bobby and grandchildren Keshia, Tomika, and Alex, along with Dixon protegé Billy Branch, and Dixon band members Sugar Blue and John Watkins. Other artists scheduled to perform throughout the weekend include Billy Branch and the Sons of Blues, Toronzo Cannon, Zora Young, Quintus McCormick, Eddie Shaw & the Wolfgang, Lurrie Bell, the Andy T. and Nick Nixon Band, Studebaker John’s Maxwell Street Kings, Shawn Holt & the Teardrops, Jarekus Singleton, Johnny Rawls, Marquise Knox, the Cash Box Kings, Eddy “The Chief” Clearwater, John Nemeth, Patrice Moncell, Dexter Allen, and the Heritage Blues Quintet, with smaller tributes also planned to honor other Class of 1915 bluesmen and woman Brownie McGhee, David “Honeyboy” Edwards, Johnny Shines, and Sister Rosetta Tharpe. This one might be a bit further of a drive or flight, but we can almost guarantee you won’t come away disappointed! 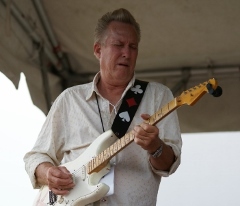 Fri., Aug 7 – Sun., Aug. 9 – Heritage Music BluesFest 2015, Heritage Port, Wheeling, WV. Keb’ Mo’, Walter Trout, and Eric Gales are just a few of the acts you’ll have a chance to catch at this festival held each year on the banks of the Ohio River, with other expected performers including John Nemeth’s Memphis Grease Party, Victor Wainwright and the Wildroots, Coco Montoya, Carolyn Wonderland, Mike Zito & the Wheel, Albert Cummings, Jason Ricci, Nikki Hill, Samantha Fish, Austin Walkin’ Cane, Gina Sicilia, and International Blues Challenge winners Randy McQuay and the Eddie Cotton Band. 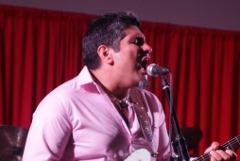 Sat., Aug. 22 – Project Blues Review 2015, LifeCare Alliance Center, Columbus, OH. It will of course be hard to top last year’s Project Blues Review, which you may recall featured its own Muddy Waters tribute with former Waters band members John Primer and Bob Margolin, joined by Bob Stroger, Kenny “Beedy Eyes” Smith, harp ace Bob Corritore, the since-departed David Maxwell, and Chicago guitarist Tom Holland. But if there’s one thing the organizers of this event have proven, it’s that they sure know how to put together a great show in the name of a good cause (raising awareness and funding to help individuals impacted by cancer). This year’s line-up features headliner Anson Funderburgh and the Rockets, with other acts including a CD release set from Jonn Del Toro Richardson; Jackson, Mississippi bluesman Bernard Jenkins (joined by Tom Holland); the Texas Horns; Dock Adams and Blues Hammer; and Bob Margolin and the Texas Horns’ Kaz Kazanoff kicking off the program with some blues on the Porch. This entry was posted in Shows and tagged Albert Cummings, Andy T and Nick Nixon Band, Anson Funderburgh, Austin Walkin' Cane, Barrelhouse Chuck, Bernard Jenkins, Beth Hart, Big Bill Morganfield, Billy Branch, Bob Margolin, Bob Stroger, Bobby Rush, Bonerama, Brownie McGhee, Buddy Guy, Carolyn Wonderland, Charlie Musselwhite, Chesapeake Bay Blues Festival, Chicago Blues Festival, Clarence Carter, Coco Montoya, David Honeyboy Edwards, Dexter Allen, Diunna Greenleaf, Dock Adams and Blues Hammer, Eddie Cotton Band, Eddie Shaw, Eddy "The Chief" Clearwater, Eric Gales, Gina Sicilia, Gregg Allman, Hamilton Loomis, Heritage Blues Orchestra, Heritage Music BluesFest, Ian Siegal, Jan Zukowski, Jarekus Singleton, Jason Ricci, Jerry Portnoy, Joel DaSilva and the Midnight Howl, John Nemeth, John Primer, Johnny Shines, Jonn Del Toro Richardson, Jonny Lang, Keb Mo, Kelly Bell Band, Kenny Beedy Eyes Smith, Lil' Ed & the Blues Imperials, Little G Weevil, Lurrie Bell, Mark Wenner, Matt Schofield, Mike Zito, Moreland & Arbuckle, Mud Morganfield, Muddy Waters, Nikki Hill, Patrice Moncell, Paul Oscher, Pete Ragusa, Project Blues, Quintus McCormick, Randy McQuay, Rick Kreher, Rod Piazza, Samantha Fish, Shemekia Copeland, Sister Rosetta Tharpe, Studebaker John's Maxwell Street Kings, Sugar Blue, Syl Johnson, Taj Mahal, the Texas Horns, Tom Holland, Tommy Castro, Toronzo Cannon, Victor Wainwright, Walter Trout, Western Maryland Blues Fest, Willie Dixon, Zora Young. Bookmark the permalink.